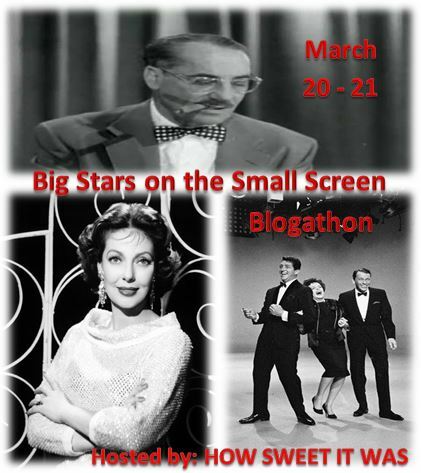 This blogathon will focus on big Hollywood stars that had their own shows, guest starred in other shows, or hosted anthology series with revolving stories. As such, there is a treasure trove of television shows to choose from – any topic, episode, series or guest appearance. You can write about the history of a series, a silver screen star’s road to the small screen or submit a review of a particular guest appearance. The only requirement is that the star(s) you choose must have had a career in the movies. include one of the event banners included in this post on your blog to help promote the event. Go to How Sweet It Was to learn more about this blogathon and view a complete schedule of the posts.